This is not intended to be an academic whitepaper but rather is a description and rationale for our investment process and a summary of our research on a critical factor in that process: Antifragility. In 1990, two years prior to the release of the seminal Fama-French (FF) three-factor model, David J. Rights and I analyzed a wide range of factors to determine which variables influence equity risks and returns in an attempt to build an investment process which provided consistent excess returns. At the time, mutual fund investors were rapidly switching from growth to value as each style moved in and out of favor. John Neff is one of the best known mutual investors of the past 40 years, notable for his contrarian and value style as well as heading Vanguard’s Windsor Fund. Peter Lynch is an American business and stock investor, and was the portfolio manager of the Fidelity Magellan Fund between 1977 and 1990. While both had remarkable long-term track records by 1990, both had also experienced long periods of underperformance. Short-term negative alpha created uncertainty regarding their acumen, raising the question, “Are they skillful or lucky?” Our objective was to determine if we could combine largely uncorrelated alpha-generating factors to build a model which provided consistent alpha. Steady, consistent alpha was preferred to high inconsistent alpha from both a statistical and practical standpoint. Low alpha variability proves skillfulness and provides institutional investors’ confidence which, in turn, importantly leads to asset stickiness. The end result of that study and subsequent research, which led to our current implementation, was we determined (a) there are three major factors which influence equity returns and risks, (b) that by combining those factors, it may be possible for investors to earn large consistent excess returns, (c) that consistency of excess returns demonstrates skill and (d) that while many “smart-beta” investors attempt to generate excess returns by tilting portfolios towards traditional Fama-French factors, which have provided historic excess returns, we use a new variable — Antifragility — in an attempt to “risk adjust” return expectations, thereby enabling us to properly price and diversify those return-enhancing factors. On November 27, 2012, Antifragile: Things That Gain from Disorder, a book authored by Nassim Nicholas Taleb was released that built upon ideas from his previous works including Fooled by Randomness and The Black Swan. Taleb defines Antifragile “…as those things which benefit from shocks; they thrive and grow when exposed to volatility, randomness, disorder, and stressors and love adventure, risk and uncertainty. Yet, in spite of the ubiquity of the phenomenon, there is no word for the exact opposite of fragile…Antifragility is beyond resilience or robustness. The resilient resists shocks and stays the same; the antifragile gets better.” In this way, we are looking for those companies which “survive and thrive” with changes in business conditions. As most companies have some fixed infrastructure and financial leverage, there is virtually no company which survives all levels of economic, interest rate, inflation or political volatility. However many companies will survive typical adverse market conditions and those with high relative Antifragility scores will thrive as weaker, more fragile competitors suffer. Similar to Antifragility, Warren Buffett describes Durable Competitive Advantage (DCA) as a source of lasting investment return. In Buffett’s world, a DCA exists when a company has “essential income,” revenue coming from the sale of products or services that are essential to people’s daily lives. Additionally, a company may also have a Durable Competitive Advantage if they provide products or services that are essential for other companies and businesses to function. The key is to sell a superior product or service that customers need over and over again. We distinguish our measure of Antifragility significantly from DCA as Antifragility looks at balance sheet, income statement, profitability and consistency measures to determine risk, whereas DCA focuses on the subjective characteristics of the company’s product, perceived monopoly or current relationship to the customer. For simplicity and marketing purposes, we originally described those factors which influenced equity risks and returns as belonging to three broad categories: Quality, Value and Business Momentum. Up until 2014, we used the term “Quality” to describe that group of income statement, balance sheet, profitability and consistency variables which included the traditional S&P Capital IQ Quality Ranking or other standard database Quality ratings as a constituent. S&P Capital IQ, an affiliate of S&P Dow Jones Indices, has provided Earnings and Dividend Rankings, commonly referred to as Quality Rankings, on U.S. common stocks since 1956. S&P IQ Quality Rankings reflect the long-term growth and stability of a company’s earnings and dividends. They attempt to capture the growth and stability of earnings and the dividends record with a single rank. The rankings are generated by a computerized system and are based on per-share earnings and dividends records of the most recent 10 years. Basic scores are computed for earnings and dividends and, then, adjusted by a set of predetermined modifiers for changes in the rate of growth, stability within long-term trends and cyclicality. Adjusted scores for earnings and dividends are then combined to yield a final ranking. In 2014, we clarified our description of those factors which predict investment volatility as Antifragility to distinguish it from the term Quality – that term is used by some investors as a credit attribute and by other investors as a measure of earnings growth and stability. We believe our composite factor Antifragility better describes a company’s ability to relatively gain under periods of volatility and thus better reflects a company’s underlying total risk. Although our original research dates to 1990, our process of purchasing Antifragile, undervalued companies with improving business momentum has a continuous real-time track record since December 31, 1998. While many investors and academics have researched historical equity returns in an effort to find incremental returns or Alpha, we have found that Antifragility scores can be used to forecast relative security risk. Moreover, by having an estimate of relative risk among securities, we can distinguish between multiple securities with similar expected returns. That is, if two securities have similar value and business momentum characteristics, we will logically select the security with the lower risk, saving our “risk budget” for other expected positive return opportunities. Importantly, we believe our recent research demonstrates that Antifragility scores predict future security volatility better than Beta. 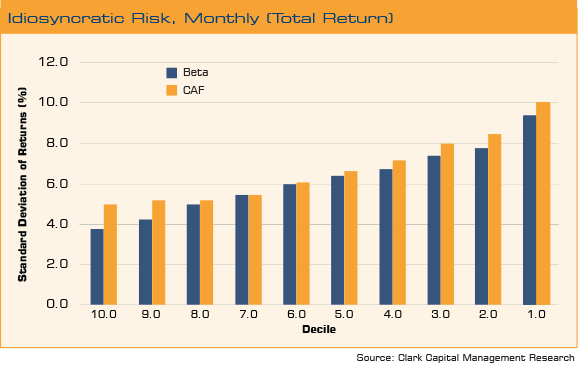 Thus, if other investors are measuring their portfolio Beta as a benchmark of portfolio predicted riskiness, our Antifragility constructed portfolios should have either higher expected return per unit of future volatility or less future volatility per unit of expected return. To test this, annually we divided our 3000 security database for each of the last eight years into Antifragility (AF) and Beta (B) deciles based on historic data. As noted above, each company is given an Antifragility score based on calculated balance sheet, income statement, profitability and consistency measures. We then calculated monthly total return of all securities for the next year and placed the same securities into total variability (TV) deciles as determined by the total standard deviation of returns. Finally, we compared each security’s AF and B deciles to their actual ex-post (TV) decile. Just as calories consumed and calories burned both correlate to weight loss, we found that both Beta and Antifragility scores correlate to future risk. Although the higher Beta portfolios we tested exhibited more future volatility and lower Beta portfolios exhibited less volatility as expected, portfolios assembled based on their Antifragility score more closely corresponded to the future risk decile. For instance, if a company is in Beta Decile 3 and Antifragility decile 4, it is more likely that it’s actual future TV decile will be decile 4 or 5. The absolute difference between Antifragility decile and TV decile is less than the absolute difference between Beta decile and TV decile. Importantly, not only did our testing show that Antifragility scores more accurately predict future risk for the period of the entire study, they more closely forecasted relative risk every year. Using our 1990 study as a foundation, we attempt to provide consistent excess returns by purchasing what we viewed to be undervalued, Antifragile companies with improving business momentum. We believe that the continuous, disciplined application of this process, which tilts portfolios towards those factors that have historically enhanced returns and reduced risk, will help us achieve our objective. 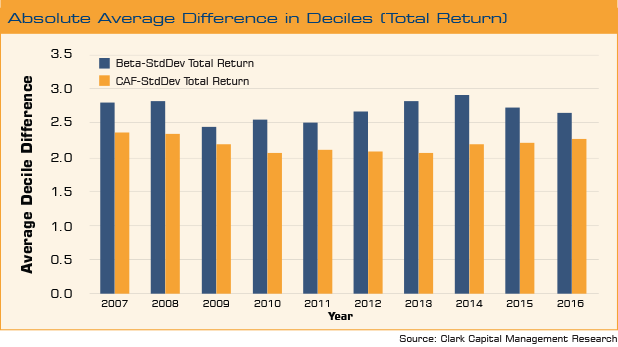 Our research is consistent with later studies completed by S&P Dow Jones Indices which demonstrate that many single-factor strategies that have empirically delivered positive excess returns in the long run have suffered substantial periods of underperformance under certain market conditions due to their cyclicality whereas multi-factor approaches provide higher consistency of excess returns7. Importantly, we believe our unique use of our proprietary factor, Antifragility, gives us an edge as we find we can more accurately forecast future security volatility than those investors that use traditional measures. One hypothetical example we use to demonstrate our philosophy is the potential purchase of our own building — One Liberty Place. 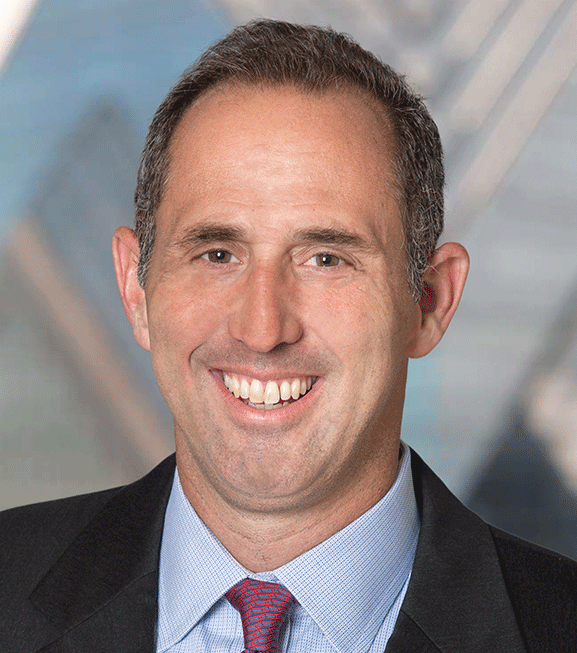 When we value One Liberty Place using a number of different metrics: price-to-rent, price-to-net operating income and price per comparable square foot to other buildings in Center City Philadelphia, we find that our average estimated value of the building is $1 billion. If were offered the building by Liberty Property Trust for $700 million, we would be fairly confident that we would be purchasing an undervalued asset. Additionally, we could show that One Liberty Place has balance sheet, income statement, and consistency characteristics of Antifragility vs the Antifragility characteristics of 10 row homes in a run-down neighborhood of the city. While both may be trading for $0.70 on the $1, it is very likely that One Liberty will “survive and thrive” under adverse market conditions but the row homes may not. Finally, to be eligible for purchase in our strategies, One Liberty Place must demonstrate improving rent momentum, i.e., rising rents due to the influx of business to the city and a shortage of available grade A office space. Thus when we go away on vacation (or as time passes), we own a property which is undervalued, Antifragile and has rising rents such that we are not concerned about transitory changes in price but rather the estimated net present value of future cash flows. That is, if we buy something at a discount to value — say at $0.70 when we think it is worth a $1 — and subsequently while we are on vacation, the price declines, we are not concerned because the spread between price and value increases and we are not pressured to sell. Similarly, if rent estimates from analysts rise while we wait so that the net present value of future cash flows increases, the spread between value and price continues to widen. As investors, our biggest problem is when price reaches value either because price rises or business deteriorates. Then risk, as our margin of safety, is removed. This initiates our sell process. In each of our portfolios, we are looking for 40 hypothetical One Liberty Places diversified across six broad economic sectors. Although our process differs from both the original Fama-French (FF 1993) traditional three factors of Valuation, Size and Momentum and the expanded 2014 model which includes Profitability and Investment, we do not dispute their result. Instead, we view the analysis of securities differently by attempting to discount each security’s expected returns by its expected riskiness — Antifragility. Additionally, FF and other academic studies highlight Price Momentum or relative strength as a security selection factor, which differs materially from our Business Momentum factor. We choose to not include Price Momentum in our process as (1) most studies do not incorporate trading costs into their analysis, (2) lower portfolio turnover is more appealing to both taxable and institutional investors and (3) we cannot justify the economic rationale or repeatability of this factor. Buffett, Mary and Clark, David. Warren Buffett and the Interpretation of Financial Statements: The Search for the Company with a Durable Competitive Advantage. Scribner. October 2008. Fama, Eugene F. and French, Kenneth R. Common risk factors in the returns on stocks and bonds. Journal of Financial Economics, Jan. 1993. Herskovic, Bernard and Kelly, Bryan T. and Lustig, Hanno N. and Van Nieuwerburgh, Stijn. The Common Factor in Idiosyncratic Volatility: Quantitative Asset Pricing Implications. Journal of Financial Economics, Dec 2, 2014. Taleb, Nassim Nicholas. Antifragile: Things That Gain From Disorder. Random House, 2012. The S&P 500 measures the performance of the 500 leading companies in leading industries of the U.S. economy, capturing 75% of U.S. equities. It is not possible to invest directly in an index. The Appendix included in this white paper summarizes what we believe to be the key conclusions made in a selection of noteworthy research reports. As the summaries are intended to provide direction to those interested in further research, descriptions of source material and information such as the construction of universes, time periods and indexes employed in the studies summarized are not included. For additional information, the original studies should be consulted. Numbers in brackets refer to the Bibliography. Views expressed are those of the individual authors. Clark Capital reserves the right to modify its current investment strategies and techniques based on changing market dynamics or client needs. The relative strength measure is based on historical information and should not be considered a guaranteed prediction of market activity. It is one of many indicators that may be used to analyze market data for investing purposes. The relative strength measure has certain limitations such as the calculation results being impacted by an extreme change in a security price.